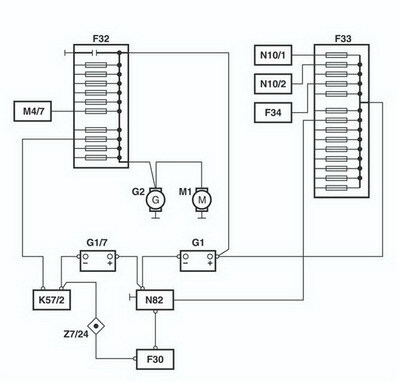 Models 211 and 219 have a two-battery electrical system, consisting of one battery (G1) in the trunk and an additional battery (G1/7) in the engine compartment. The additional battery (G1/7) serves to stabilize the on-board power supply voltage and can be activated in certain situations (e.g. voltage < 10.5 V). This voltage is not measurable directly at the battery because it is an advance estimate of the voltage of the battery control unit (N82). The voltage actually measurable at the battery is slightly higher. The on-board electrical system in models 211 and 219 is managed by the battery control unit (N82). It uses the measured current, voltage and temperature values to evaluate the state of the battery and initiates measures to stabilize the on-board electrical system if necessary (e.g. consumer shutoff). 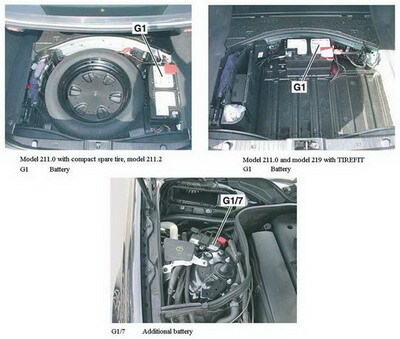 The battery (G1) is located in the trunk. The precise installation location varies according to model designation (model 211.0 and model 211.2) and equipment (TIREFIT/compact spare tire). The additional battery (G1/7) is located on the right at the rear of the engine compartment. to wet-cell batteries with a capacity of 74 Ah and 100 Ah. Exceptions to this are USA (code 494) and Japan (code 498) versions, model 211.2 with 3rd seat row, taxis and vehicles with engine models OM 642 and OM 648. 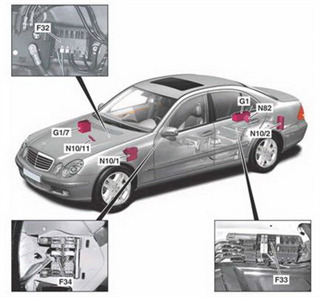 In this section we add some useful information about some Mercedes Benz 211 Battery Control System and it features.